For the first time in nearly a half-century, Penn State named a new head football coach. It wasn’t a popular move among the students, fans or even the alumni. But it was a move that needed to be made. Joe Paterno was a figurehead at Penn State. He stood for everything that was right in college football. While winning a national championship, Auburn's marquee player underwent an investigation for accepting bribes to attend the university. While Southern Cal was making annual appearances in the Rose Bowl, their Heisman Trophy-winning running back cruised around in a brand new whip. And while Ohio State beat down on Michigan, their starting quarterback traded gold pants for tattoos like Pokemon cards. But that all took place before November, before the world discovered that a scandal had fallen upon the university. 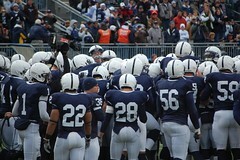 Paterno may not have been the culprit, but acting in disregard doesn’t alleviate him of consequences. We know the story. Former defensive coordinator Jerry Sandusky has been accused of more than 50 counts of child sexual abuse over a span of 15 years. According to testimonies, Paterno was notified of the abuse but failed to exercise his power to bring it to an end. Today, as Paterno continues to fight lung cancer, his university is a state of disarray. Still, the longtime coach finds himself in the eyeof the storm. A week after Patriots offensive coordinator Bill O’Brien, a coach with no connection to Penn State, was named as Paterno’s successor, the Penn State board of trustees released a statement on Paterno. The statement came after University President Rodney Erickson held a town hall meeting in which boosters and alumni demonstrated their reproach with the situation. In hindsight, perhaps the divorce could have been carried out better. But in the whole scheme of things, those are minute details. As I mentioned earlier, Paterno was the figurehead of Penn State. He was a face on the Mount Rushmore of college football. And after he was said to have been a part of one of the most daunting scandals in sports history, his immediate removal was necessary; it was just; it was the right course of action. Likewise, just as Paterno’s dismissal received a slew of criticism, the O’Brien hire drew a similar response. The shock! The betrayal! The university opted to bring in a Brown alum to coach Penn State? What’s next – we leave Jay Paterno off the staff? Oops. Bringing in an outsider may not have been the route many alumni expected the school would take. But given the cloud of disgrace hovering directly over State College, a new face with a clean background is the only way to draw the attention away from the court room and back to the football field. It may be years before Penn State returns to college football prominence. Honestly, it may never make it back. Forever, there will be a scar on the face of the program. There will be an asterisk next to Paterno’s name in the Hall of Fame. There will be hesitation by every mother and father when their son tells them they want to be a Nittany Lion. But creating distance – at least temporarily – between Paterno and the university, by allowing the jury to absolve the coach’s name, by letting the attention return to football, there’s a chance that Penn State can bounce back. Next Post: Who’s More Hipster?